Cervical Artificial Disc Replacement is a procedure which replaces a diseased or damaged disc with a device designed to maintain motion. There are several different models on the market today; disc replacement can be performed at one or two levels in the cervical spine. 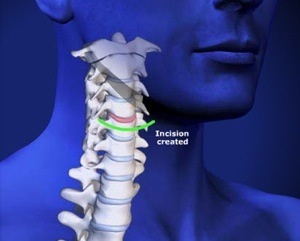 This procedure is not recommended for all patients with neck pain or radiculopathy. Patients must be selected carefully to assure a good outcome. Primary Bone Pathology Such As Infection. With the help of fluoroscopy or X-rays, the device is implanted in the prepared space between two vertebrae. The implant is designed to preserve motions of spine such as flexion, extension, side bending and rotation. It also helps to keep the cervical spine properly aligned. The patient is usually discharged from the hospital after 24 of operation. This surgical procedure has minimal movement limitations. The risks of this surgery include early or late loosening of the components, anatomical or technical difficulties, and component sizing issues. Other possible problems include tissue reaction and formation of bone that may reduce spinal motion or result in a fusion.